Life With A Love Bug: A scary night! It could have been so much worse! A scary night! It could have been so much worse! It could have been so much worse and I am so happy that everything worked out and that myself and my car are ok. The other day I had to go out of town for work to another city about an hour away from where I live. 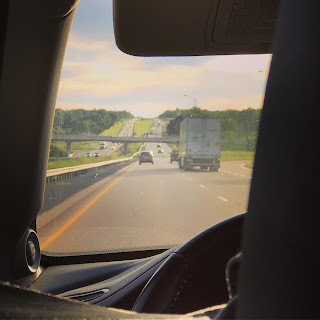 I hadn’t driven on the highway since getting my license and I was slightly nervous about it but then I wasn’t if you can understand what I am trying to say. Any ways my dad had taken me out to where I had to go a few days before so that any anxiety would not be an issue because I knew where I was going and how to get there. I have a lot of anxiety but over the years I have learned how to mostly overcome a lot of it. For me the anxiety of driving is not driving its self but its the getting into the car that I get anxious about once I'm in the car I am anxiety free and feel pretty calm. So the day came and I had to get into my car take a few deep breaths and make my way to the highway I was able to make it to where I was going with no real issues other than that one stupid transport that is being risky on the highway but when do you not have one of those. I went and did my day of work and was finished around 9pm. I got into my car and headed for home. The lights on my car are automatic so I didn't have an issue just starting up the car and heading on my way. I don't drive very much at night and had never driven on the highway at night so this day was just a bunch of firsts for me. I'm trucking along on the highway doing 110 and the highway is pretty quiet at this point there aren't a whole lot of cars on the road which was nice compared to earlier in the morning. I see the sign for the town over from where I live and I am relieved to see I am almost home as it had been a long day. All of the sudden my headlights shut off! So here I am first time driving at night on the highway going 110 with no lights in the pitch black. Let me tell you at this point there is a ton of swearing going on as I am playing with the knobs to my left trying to get my lights to come on not able to see in front of me and I can here I'm off on the shoulder because I can hear the grinding of the beveled parts to tell you your going off the road. I can't pull off to the other side of the road because there are construction cones so I'm trying to think of what the hell I was supposed to do. I turn on my signal light to see if that is working and to hopefully show anyone that might be behind me that I am in the road ( I didn't even think to put my hazard lights on till later). Low and behold my friggin lights came back on right after turning my signal on!! I of course told Siri to call home and swore up and down to my parents telling them what just happened! I am so glad that I didn't run into the median or go off the road and I was able to keep calm enough to keep going but holy crap! I am thankful for myself and my car to be alive and unharmed! You better believe ole Bessie is going in for a check up sometime this week.